Government of Pakistan has announced 69 latest Government Jobs 2018 in Pakistan Ordinance Factories Board (Wah Cant). Interested Candidates can apply for these New Government Jobs by online registration at www.pof.gov.pk before given date and time. Jobs titles are Specialist Doctor, Manager Technical, Assistant Manager Technical, Assistant Manager Chemical, Assistant Manager Civil, Assistant Programmer, Assistant Manager Admin and Medical Officer. 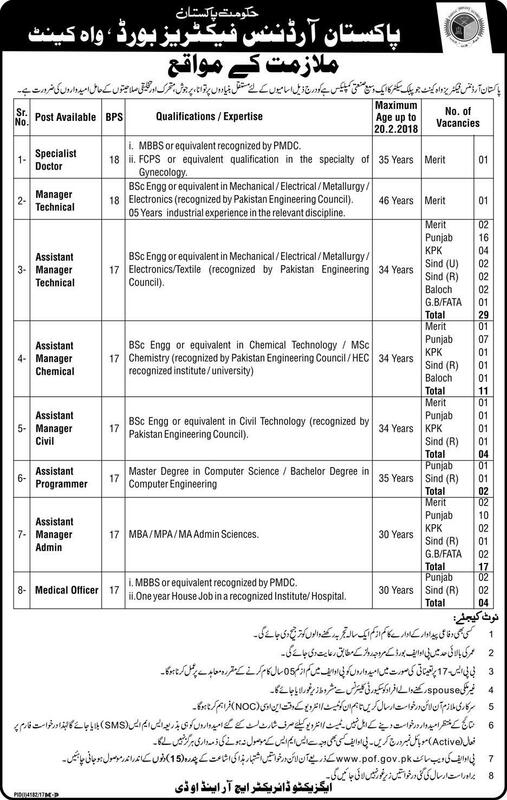 These jobs are on permanent basis and candidates from all over the Pakistan may apply for these jobs.